Padraig Harrington’s experience could be an asset when the Ryder Cup wildcards are announced on Monday. Picture © Getty ImagesPadraig Harrington will be praying that skipper Jose Maria Olazábal listens to Colin Montgomerie and opts for experience when he names his Ryder Cup picks on Monday. The Scot famously handed Harrington one of his three wildcards for the matches in Wales two years ago. And while there are only two picks this time, the 2010 skipper reckons Ollie needs all the experience he can get when Europe defends the title in front of a hostile Chicago crowd. Dropping a strong hint for a Harrington pick, Monty told Sky Sports: “A team with no rookies in America is a stronger one, I feel. It’s difficult, there is no question. “It is a different environment than it is at home. There is 90 percent of the crowd for America and only 10 percent for us and it is more difficult. 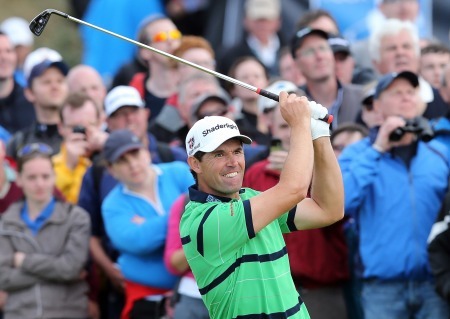 Harrington is the most experienced player looking for a pick after six successive appearances. But he knows he needs to win The Barclays this week to force Olazábal to backtrack on remarks he made at the US PGA. The Spaniard all but ruled Harrington out of the reckoning because of his putting, insisting: “He’s well down the list. “From tee‑to‑green, his game has been fairly good, but I think his putting has let him down this year so far. Harrington is determined to continue his run of fine form in New York and notch up his first US or European Tour win for four years. He knows it’s his lash chance of a Ryder Cup pick, having confessed during the US PGA: “Obviously I’m not in the reckoning as it stands. So I have to do something exceptional. At least it’s clear. Olazabal knows nine of his 10 automatic qualifiers with Nicolas Colsaerts the only rookie who can force his way into the side with a top-two finish in the Johnnie Walker Championship at Gleneagles this week. If the big hitting Belgian makes it on merit, he will knock Germany’s Martin Kaymer out of the side. That will leave Olazabal to choose two wildcards from a group of around a dozen that already includes Harrington, English Ryder Cup ace Poulter and Spaniards Rafa Cabrera Bello and Gonzalo Fernandez Castaño. Olazábal looks certain to pick Poulter but Montgomerie reckons the Spanish skipper will not go far wrong by adding more experience to his team. Dropping a strong hint for a Harrington pick, Monty said: “I think that experience is the great strength of the side. I had six rookies in my team and Jose might have none. Just a year after waking up to find the Claret Jug glimmering at the foot of his bed, Padraig Harrington enjoyed a hearty bowl of porridge, flipped open his laptop and perused the Ryder Cup rankings with a grin on his face. Des Smyth has hailed Colin Montgomerie as the perfect antidote to Nick Faldo’s disastrous Ryder Cup captaincy. The Laytown and Bettystown legend, 55, joined Darren Clarke and Padraig Harrington in giving Monty the thumbs up as skipper for the matches at Celtic Manor next year. Despite his erratic form over the past two years and his less than stellar recent record, it was no great surprise to see Pádraig Harrington named as one of Colin Montgomerie’s three Ryder Cup wildcards. Colin Montgomerie won’t regret handing Pádraig Harrington a Ryder Cup wildcard if the Dubliner does half of what he’s promised to do at Celtic Manor.